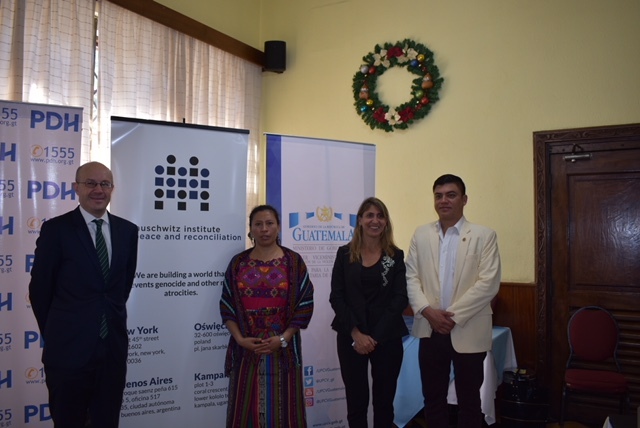 On December 7-8, 2017, the Auschwitz Institute for Peace and Reconciliation (AIPR) co-organized a national seminar in Guatemala City with the Guatemalan Network for the Prevention of Atrocity Crimes, the Vice-Ministry of Violence and Crime Prevention, and the Office of the Ombudsman of Guatemala, in collaboration with the United Nations Office of the Special Advisor on the Prevention of Genocide (UN OSAPG). Entitled “Tools for the Prevention of Genocide and Mass Atrocities,” the event looked to accomplish four primary objectives including familiarizing participants with the concepts of genocide and mass atrocities as well as the relevant international standards for their prevention, equipping them with the competencies to prevent atrocities at all points of the conflict cycle, reinforcing and protecting provisions of international security, and strengthening national preventive capacities. A total of 41 participants from a variety of national institutions attended the two-day seminar, including representatives of the Office of the Ombudsman, Ministry of Governance, Ministry of Foreign Affairs, Secretariat of Social Welfare, National Program for Reparations, as well as representatives of San Carlos University, the Center for Human Rights Action (CALDH), and Women Transforming the World, among other civil society organizations. The event began with an opening ceremony, which included remarks from Jhefry Hernán Morán Espino, General Coordinator of the Prevention Unit, Miriam Roquel Chávez, Deputy Ombudsperson, Mario Buil-Merce, Political Affairs Officer from the UN OSAPG, and Eugenia Carbone, AIPR’s Latin American Program Director. This event marked an important milestone for Guatemala as a member of the Latin American Network, as it was the country’s first national seminar on mass atrocity prevention. In her opening speech, Deputy Ombudsperson Miriam Roquel reiterated the joint responsibility held by all to prevent the occurrence of genocide and other atrocity crimes. Additionally, she affirmed the importance of “knowing Guatemala’s past, studying it, and teaching it to future generations, so that it may be prevented through education.” Finally, Carlos Sosa, Focal Point for Guatemala in the Latin American Network, highlighted the seminar as the first effort in a broader process of guaranteeing a national commitment to the prevention of mass atrocities. During the first day of the event, Tatiana Gos, Academic Programs Officer at AIPR, presented an introductory module to the concepts of genocide and mass atrocities with a preventive approach. Following this, Eugenia Carbone discussed existing international legal frameworks on prevention with attendees. The afternoon session was led by Mario Buil-Merce, who presented challenges on the Responsibility to Protect, early warning mechanisms, the role of the United Nations and policy options for prevention. 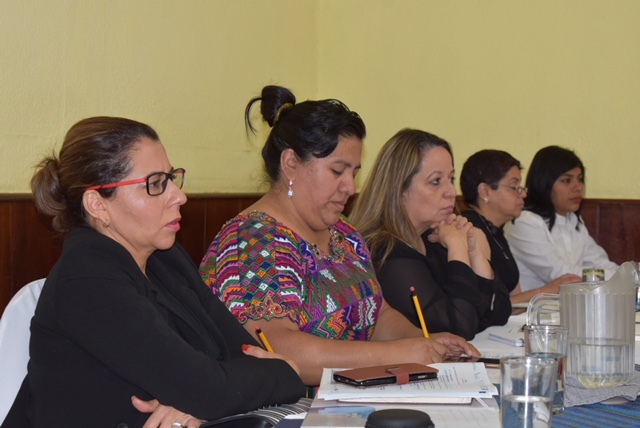 On the second day of the seminar, the work of the Latin American Network for Genocide and Mass Atrocity Prevention was introduced, and a discussion on international human rights standards and their relationship with preventive efforts was convened. Following this, the day continued with a module given by Dr. Mónica Mazariegos Rodas on gender violence as a risk factor for genocide and mass atrocities, as well as another led by Ruth del Valle on atrocity crimes in Guatemala from both historical and contemporary perspectives. Additionally, a discussion panel on the challenges of prevention was convened, followed by an opportunity for dialogue between the panelists and those attending the seminar. Finally, an observance of the International Day for the Commemoration and Dignity of the Victims of the Crime of Genocide and its Prevention was held, which included a moment of silence. A joint message prepared by the Latin American Network, included below, was also shared. 69/323. International Day of Commemoration and Dignity of the Victims of the Crime of Genocide and of the Prevention of this Crime (Resolution approved by the General Assembly on September 11, 2015). Latin American Network for the Prevention of Genocide and Mass Atrocities. On the occasion of the International Day of Commemoration and Dignity of the Victims of the Crime of Genocide and of the Prevention of this Crime, the Latin American Network for Genocide and Mass Atrocity Prevention encourages the international community to reflect on the atrocities of the past, as well as as to honor their victims and families. Additionally, we invite the international community to join efforts so that, under the banner of “Never Again,” more and more voices and resources can be made available for the design of a global agenda that consolidates visions and efforts in the area of human rights and atrocity crimes prevention.